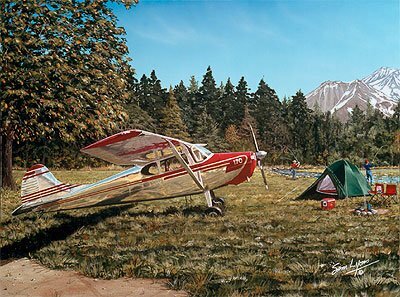 You may recognize the polished silver Cessna 170 in this idyllic scene but here's something you don't know. The pair of fishing nature lovers are Sam and his wife Mindy! The 15.5" x 22" prints are available ONLY as an edition of 50 Enhanced Prints on Canvas. It comes framed with linen liner and wood frame.